YOU CAN'T GET ANY CLOSER THAN THIS! A full range of rentals all beautifully furnished sleeping as many as 16, air conditioned & heated with access to all of the parks many amenities. What is there not to like about this place? The park is literally on the beach, with several sites overlooking the gulf. The staff is very friendly and responsive. Another park full of snowbirds, but everyone is very friendly. The park is well maintained, and is located near interesting places to visit. Although the weather has prohibited us from enjoying the beach, we have enjoyed many of the restaurants and drinking establishments in the area. Were able to get a 3 weeknight stay booked just a week in advance, the location is fabulous (RIGHT on the beautiful white sand beach) and close to plenty of restaurants. It's a bit noisy and crowded as sites are a bit tight. Kids running, screaming and riding bikes EVERYWHERE during daylight hours but it was quiet after dark. We stayed between pools and enjoyed the landscaping. Everyone working in the park that we interacted with were very friendly and helpful. Didn't use the laundry but it was spacious, clean and not crowded the times I checked. All parts of the park were very clean. Something for everyone. Limited Beachfront spots with all hookups except sewer. But there is a dumping station and a service that will come to your site and pump for you for $10. The management team are extremely nice and helpful. It's a place we always wanted to visit and finally did! Plan ahead because it's always full - that means it is awesome! We stayed a week during August 2017 which ran into the first two days of September, of which the park called holiday days. Labor Day was on the 4th of September. We have been coming to Camp Gulf for over 15 years and we commend the owners for the updates they have made. We tried to check reservation availability for the next year and were told those sites were already reserved, I questioned how that could be since it was over a year prior, I was told that If you reserve for an entire month that you can make reservations 13 months prior and if you stay three months that you can make reservations 14 months prior. So much for the standard 12 prior reservations, if you can only stay less than a month you're out of luck. This reservation policy starts in the month of September. This is unfair reservation policy. Just my two cents. Very nice RV Park. Loved the restrooms just hope they can keep them nice. We only stayed 2 nights but it was very convenient right on the beach. Lots of amenities. A little expensive but the same as most other parks and it was right on the beach. Even got our trailer washed while we were visiting. What a convenience. Wish we were back at the beach now! Would stay here again. Our third trip to Camp Gulf. As they say, location, location, location! If you like the beach then this is your campground. Had a great time and site was excellent as was employee help getting into site. They guide you the whole way. Unfortunately not everyone follows the pet rules as we did see some very large dogs (over 60 lb limit we were told about) and some poop not picked up. Bathrooms are great and generally clean, but like with the dogs not everyone cares and we did see some restrooms left dirty before they could be cleaned by the staff. 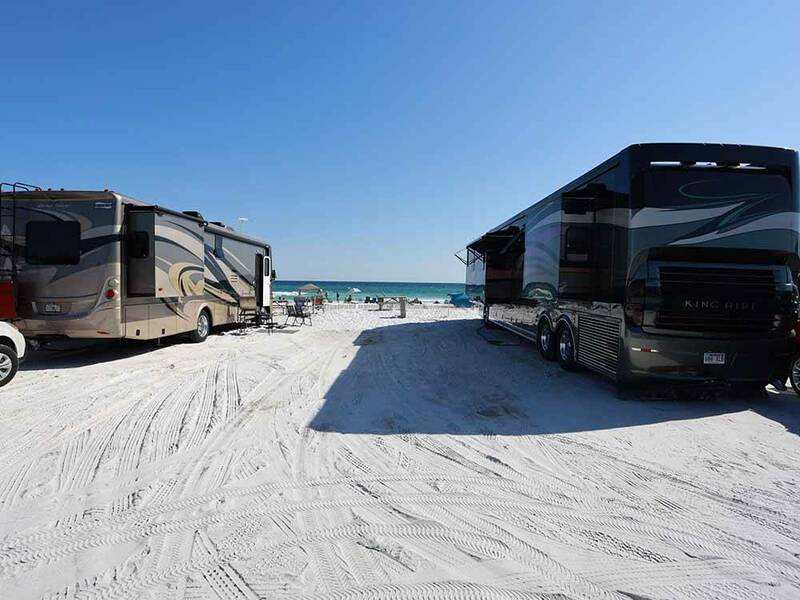 Great location in Destin ... RV park with private access to beach. We stayed in several different spaces - prefer the non premium sites which are a lot bigger and more private -whereas the premium sites are much smaller and closer together. All are close enough to beach. Good clean restrooms - private shower stalls with a bench for items. Short distance to the Premium Outlet Shops (very nice - big selection) of quality stores. Entrance/Exit to RV park can be tricky since highway is so busy - no traffic light. Good friendly staff! We stayed here for 6 nights, right on the beach. PERFECT site and weather. Although the beach front sites are a little pricey, it was exactly what we wanted - front wheels in the sand, front window view of nothing but beach and Gulf of Mexico. All the staff are very friendly and helpful. Beach front sites do not have sewer hookups and do not allow pets, but a pump out service is available. All other sites are full hookup and do allow pets. This was a perfect vacation for us, I do not recall a more serene or relaxing vacation anywhere. We will be coming here again, and are looking forward to it. We will probably also rent one of the cabins for the children and grandkids so that we can take a vacation together but separate ;-) The sites on the beach are pretty close together, but the other sites looked more spacious. There are many site options to choose from, sunny to shady. Many activities are available at the RV park. No discounts are offered for the beach front sites at any time, but other sites do have discounts. The beach front sites can be pulled into or backed into - if you pull in for the view out your front window, make sure you have sufficient length for power, water and cable. The cable and wi-fi were decent. Park/Resort had very good amenities. Restrooms/Showers were clean and spacious. Staff was helpful and kind. Steps from the Beach, beautiful white sand beach and emerald water, enough said. I'll start with the good; The beach is a big plus actually being on the gulf side. The restroom and showers were always very clean and well maintained. The staff was generally friendly and helpful but not infallible. As for the bad; There are too many spaces for the available area and my site was so small that I was apprehensive about opening the slides and awnings were out of the question entirely. My neighbor on one side and I could have likely shaken hands out our side windows. The whole facility seemed badly outdated and in a poor state of repair EXCEPT for the restrooms and showers. WIFI existed but had no bandwith to speak of. To summarize, the conditions of Camp Gulf as they were during my visit of May 2016 were not very nice and when the cost is factored in it makes it unacceptable and I will not return. Camp Gulf was an outstanding camping experience. Easy walk to the beach from the upper park. Facilities were clean and well maintained. The staff was very friendly and accommodating. Kids loved the playground and pool. Camp host did an excellent job backing me into the campsite. 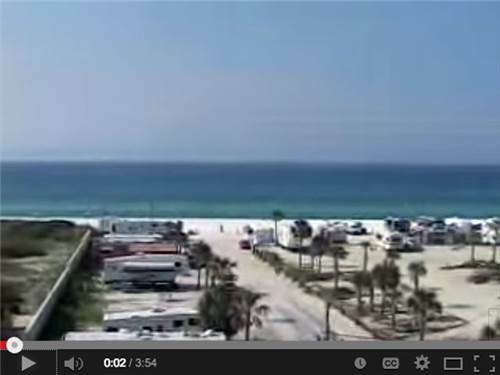 Easy access to restaurants and activities in Destin. Overall great trip, we will be back to Camp Gulf. Great RV resort. We stayed one row back from beach. No dogs allowed on the beach. Resort staff was very friendly and helpful. We had no problem with the wifi, but others did. Washrooms were the best! Individual, large, clean and well maintained. The laundry facilities were nice but could use a little updating, equipment was showing use. We were told they plan to do a remodel. It was a little pricy, but location and care of the facility were worth the price. We were there for 2 nights and unfortunately when we were there a storm was brewing so weather was cold and we could not use the beach, so we left earlier than planned. We would stay there again. Great place to stay the only bad thing I can say is the WiFi is a little unreliable I'm always searching for a signal. This is a great park if you want to be close to the beach. We stayed one row back from the beach and our family had a great time. The park is clean, the staff is friendly, and willing to help whenever possible. This is the 4th trip to this park with our family. The rates are a little high but worth it in the end. The park is very kid friendly and the nicest park I have ever been to. Will be there again next year. our 6th year at Camp Gulf, and we upon arrival pay for the next year! always spotlessly clean restrooms/pad/pools/beach. the staff is always friendly from the time your whisked away upon driving in , to offers to help set up your site. every employee i have ever come in contact with is friendly. this year we needed a repair on fridge and were recommended to one that was excellent and reasonably priced. The price is higher than most in the area, but none offer the amenities, and certainly not beach, beach/ocean view, 2 pools/hotub, and absolute cleanliness that is Camp Gulf . The best Park on the Emerald Coast, been coming here since 2004, will start with another trip this month to make it a twice a year trip covering 5 - 6 weeks. Keep up the good work and facilities. Just finished an 8 day stay at beautiful Camp Gulf and can't say enough good things about it. We stayed in the upper park with spacious sites, plenty of shade and grassy areas. This is the only park we found that is actually on the Gulf of Mexico. If you want, there are sites right on the beach. Bath houses (3), had individual rooms with shower, sink and toilet. They were very clean during our stay. The staff is very friendly and helpful, always available. There are two pools, a hot tub at the north pool , check in at the front office or at Leona's Gift Shop in the middle of the park. Considering the location, the prices are very reasonable. We have already reserved our spot for next year. The only drawback we found is that WIFI service is spotty. No problem for us as we carry a hotspot but be prepared. Lots of water activities and otherwise, a kid's dream! You name it and Camp Gulf has it. Come see our new waterslide. Not to mention two swimming pools, a clubhouse and many planned activities. Last but not least, the Gulf of Mexico with beautiful white sand beaches to play on. All the Fun the Gulf of Mexico offers! Camp right on the beautiful white sand beach, surf, paddle board, swim or just frolic in the surf. Or you could raise your pulse rate on our thrilling water slide or Segway rentals. Fun for everyone in the family. We have beautifully furnished cabins that are perfect for a couple, a group, or even a family reunion! Come join us for a vacation that's sure to be special.